The gist is you send in three articles you hate and three articles you loved and explain why. The prize? A pile of gaming swag (awesome) and the chance to be a Kotaku editor for the day. Write some articles (with byline), participate in a podcast and generally be awesome. This was a great idea, so yesterday I scoured their site and sent my response designed to look like their reviews. I thought it was great, today I find out the finalists were picked at RANDOM!! Random, seriously, why not just ask people to say ME! in the comments and pick them randomly. Sigh...I am pretty bitter as I liked my submission...here it is for your perusal. Hello Kotaku editors! This is a great idea for a contest; I have to admit I am more excited about the editor for a day aspect then the swag itself...though I will gladly take the swag! 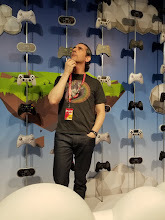 I have long wanted to be in the gaming industry, in fact I write for the blogcritics gaming section and participate in the official gaming podcast weekly on blogtalk radio so this contest is a dream come true. Don't follow the pack: The writer looked at the game as a fresh experience and was not basing his review on previous games and their style. He looked at the experience as just that, yes it was easy, yes there was some repetitiveness but the overall experience was wonderful. Just right: The review was a great length and touched on most of the main strengths and weaknesses of the game. The writing style is great as well, Fahey mixes words well and uses game lingo in the review effectively. Hilarious: Writing an article about a KFC meal...and actually subjecting yourself to eating it? Priceless! Very similar to reviewing a crappy game, you have to suffer for your craft. Great format: Writing this as if it were a proper review/impression made this article that much more enjoyable. I laughed out loud while reading this and that is rare for me. Pictures are worth a thousand words: The pictures added a great deal to the article, the last shot especially turned my stomach which reinforced the hardships McWhertor had to endure. Effective review: Luke has a knack for writing fairly brief points that show the positive and negative points effectively. The 'It doesn't work' sections were clear enough to let you know that this is a promising game that is broken. Funny: From terms like Puckered up to taking about the game like it is an entity this review was humorous, but not in a try to hard way. Learning is good: Though the review was brief it gave all the key features in an easy to follow manner. Learning about the interface, media centre connectivity and feature-sets was enjoyable. Is this a Thesis? : AJ is newish to the Kotaku tower and she sometimes doesn't realize that brevity and clarity sometimes are better then length. This is an impression of the Skate 2 game and its depth is to the analytical level. I glazed over at times when reading this article and it did not keep my attention. Inconsistent language: At times professional and correct, at others write-speak style text. The changes in tone throughout the article left me re-reading certain sections. Is this my Blog? : No offense, but this is the kind of lame thing I would put on My Blog, seriously, I have no press access so I just put pictures and links up plus my own experiences. Kotaku deserves better then this brief and generally useless 'article'. What's the point? : Apologizing for blurry pictures? Teasing a Persona 4 article? Was there an article quota and the normally great Fahey had to submit something? This would have been a great footnote in the Persona 4 article, otherwise it was just filler and uninteresting at that. It's Good! Or is it? : I might be shooting myself in the foot in the contest by saying this, but even though this is an impression and not a review, a proper impression would be nice. Quite frankly I am not sure why this wasn't labeled a review, you have the keypad, you tried it, yet still there is no definitive opinion on it. Re-read or Die! : Repeats of phrases, sentence fragments and awkward writing (sorry Crecente!). This article seemed to be a quick throw together and was not to Brian Crecentes usual high standards. A thorough re-read would have brought some of the weak areas to the writer's attention. You tried it...right? : No impressions of in-game testing, messaging or even userid name changes. A hands on impression shouldn't just be 'I put my hands on it'. A lot of us would love to know if it is a useful device and trust Kotakus opinion. This article should have offered much more but took a shortcut. So there it is, I hope I don't anger anyone...just being honest! =-) Have a great day and I really hope I hear that I am a finalist so I can show an example of my writing.